For a while now I’ve been planing to visit Berkley church, near Frome in Somerset. Finding myself not far away the other day, I pulled up outside and walked up the churchyard path as children played noisily in the nearby school yard. Church, school, and manor house all together: all very fitting. But my progress was blocked by the iron barred doorway in the tower, which was clearly locked, as was the vestry door to one side. What to do? I peered through the bars and caught sight, on the noticeboard inside the tower and just visible from where I stood, of a notice saying that a key was kept at the school. So I retraced my steps and, now armed with a bunch of keys, walked back, taking in the building for a second time. A very plain little church – a whitewashed stone box fronted by a peculiar tower that starts monumentally at the bottom like Hawksmoor and finishes on the skyline more delicately, like Wren. None of this prepares the visitor for what’s inside this building of the 1740s: a square space with four Ionic columns, soffitted ceiling and dome, very much in the classical tradition and not unlike the sort of thing you might find inside a small Wren church – except that the delicate plasterwork is quite unlike anything produced by Wren or Hawksmoor. This filigree of shells, C-scrolls, wheat ears, and foliage is the sort of thing you hardly ever see in an English country church, not that often in an English country house. I would't call it typically English, apart from the palette, which reminds me of Wedgwood pottery. The ceiling is a glorious one-off, and a visual shock after the austere exterior. *Michael McGarvie, St Mary’s Berkley: A History and Guide (1992), available in the church, is helpful here. 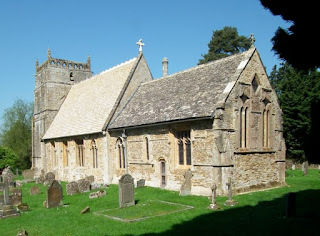 †The phrase ‘stuko man’ is used in the contemporary Day Book at Corsham, suggesting that Stocking was well up on the latest patent plasters. The material at Berkley, however, seems to have been old-fashioned plaster, bound with hair, rather than one of the patent stucco mixes. 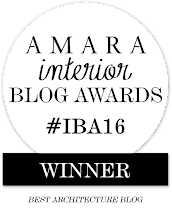 ¶A strip of carpet on the floor made this experience slightly more comfortable then it might have been. 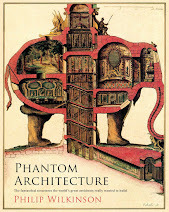 I’ve blogged before, more than once I seem to remember, about buildings and memory: so often, I find, architecture is a trigger for some recollection. When I was looking through my pictures and wondering what next to share here,* a memory from decades ago welled up from somewhere. ‘Green and pink,’ said my friend, looking out of my window in Oxford and taking in the view of backs of cottages. So here are green and pink again in Lavenham, spotted in the sunshine last summer: modern pastel shades on buildings several hundred years old, and no worse for that. To my mind the colours enhance this modest vernacular architecture and contribute to a wonderfully effective streetscape. Often it’s the original features – sash windows, timber framing, jetties – that we notice, taking the colour for granted. But it’s the colour that makes these buildings (at least from the point of view of the passer-by), both the colour of the walls and of those wonderfully variegated tiles. Long may they delight the eye and start the memory working. 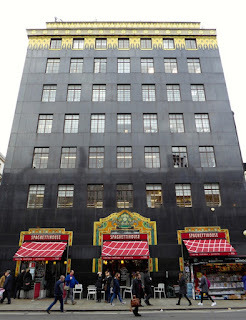 *My usual way, as regular readers will know, is to post about buildings I've seen recently. But now and then, for the sake of variety and to relive old visits, I choose something I saw a while back. †Another post concerning colour, this time in Tewkesbury, inspired a number of comments from readers. Standing in the corner of the churchyard at Eastnor, Herefordshire, is this extraordinary seat of c. 1900, sheltered by a sloping tiled roof and adorned with a series of five large terracotta panels, each bearing a sculpted figure and a Christian text. Many is the visitor, tending a grave perhaps or just taking a stroll, who must have been thankful for this unusual bit of churchyard architecture, their eyes moving across the sculpted panels and their messages: from a figure representing the harvest (‘They that sow in tears shall reap in joy’), past an angel, Christ in Majesty, another angel this time carrying a child, to a sower (coming back to the agricultural metaphor again: ‘He that now goeth on his way weeping bringeth forth good seed’). 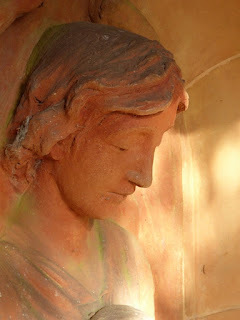 There’s much to admire in the gentle realistic modelling of the figures and faces, from the upward-glancing harvest figure (sometimes called Ceres) to the expressions of repose in the faces of the angels. If the user of the seat is thankful, who deserves their thanks? The seat was provided by Lady Isabella Somerset (also known as Lady Henry Somerset, 1851–1921), one of the notable social reformers of the late-Victorian era. She was stuck in an unhappy marriage: her husband was gay, a fact he only revealed to her after the wedding. She bore him a son, moved out, and threw herself into social work. Lady Somerset was a leader of the temperance movement, a campaigner for the emancipation of women, and an advocate of contraception. But she did more than campaign. She gave funds to causes she supported, devoting much time and money to causes such as a home where women alcoholics were helped to overcome their addiction. She was a pragmatic social reformer; it was not enough for her piously to condemn, as some of her contemporaries did, those addicted to alcohol: she wanted to help them too. Small gestures like this churchyard seat in the village next to the castle she inherited, not to mention the well on the village green, must have been typical of her. 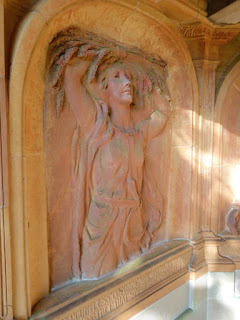 Some sources (including Pevsner) say that Lady Somerset actually modelled the terracotta panels herself. This surprises me in a way: they seem very good for an accomplished amateur with a very busy life; and yet Lady Somerset seems to have been a person who could pull surprises. Whoever did them, though, clearly had a flair for modelling and a sympathetic eye for female faces. As for the donor, it’s perhaps typical that she wanted people to have not only rest and shelter, not only religious messages to ponder, but beauty too. A very Victorian mixture of values, and by no means a bad one. Note I first found out about the seat from the excellent Tile Gazetteer compiled by Lynn Pearson (Richard Dennis, 2005). My previous post about the striking lettering on the Desborough corset factory reminded me of something similar that I saw not long ago in Swindon. This time it’s a shop, and one that follows the pattern for big, well lit premises of a specific kind of retailer in the late-19th century. William Wallace Hunter came to Swindon from the East End of London in the late-19th century. By the 1890s he had a furnisher’s shop in the town and in by 1901 his business was installed in these premises in the centre of Swindon on the corner of Edgeware Rad and Regent Street. 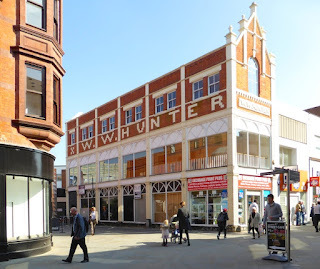 Like many furniture shops in the period, Hunter’s was large and well-lit: a real showroom, where he could display large pieces in a light setting ensured by generous areas of glass on the ground and first floors. The proprietor’s name was built into the structure, with a stone panel on the end and huge letters made up of a tessellation of white-painted blocks on the long facade. Like many Victorian and Edwardian enterprises, it seems to have been undertaken with optimism: this kind of built-in lettering suggests that the business was here to stay. I’m not sure exactly how long the business lasted. Online sources mention the 1940s, and the local archives hold records of the company up to 1941, so it seems to have reached its half-century at least. It’s a shame those light upper rooms are no longer used in the original way, but at least the building survives, together with the lettering, to remind us of the enterprise that created it. ‘Follow me. I’ll pull in at Desborough. There’s something there you’ll like,’ said Mr A. So I followed the Jaguar’s tail, knowing my friend’s unerring instinct for buildings and interesting bits of England, and soon the car turned into a small hardstanding. I was confronted with the long brick elevation of the former Co-op Corset Factory. * Mr A knew that I’d admire the restrained brick facade (even though the window frames have been replaced), the neat vents along the roof one, and, above all, the lettering. I have an enduring fascinating with the different styles of lettering on buildings, and the different methods used to create it. Here, the letters have been built up out of white bricks or tiles, with special corner pieces to make the curves of the C and O, parallelograms for the sloping legs of Rs and As, and even tiny triangles to create the ends of the hyphen in ‘CO-OPERATIVE’. The lettering is not perfect. I suspect that those for whom God is in the details would have refined that E, for a start. But it’s clear and legible and part of me finds the informality refreshing. It stops the lettering being as tight-laced as the factory’s original products, after all. * Lingerie is still made there, but the factory is no longer owned by the Co-op. Later update: I should perhaps have added that this lettering is very similar to that on the Co-operative Bakery in Kettering, which I spotted a while back. The Desborough factory is from 1905, five years later than the bakery, and the design is attributed to an in-house Co-op architect. The light was already going when, just before Christmas, I walked past Liberty’s along Great Marlborough Street, glanced for the umpteenth time at the building formerly known as Ideal House, and remembered that I’d never taken a photograph of it. So the conditions were less than ideal for capturing this monumental art deco block, built as offices for the National Radiator Company in 1928–29, but I went ahead anyway, doing my best to avoid bumping into people as I backed towards one of Liberty’s windows to get the building in the frame. Ideal House (it’s now called Palladium House) was designed by Raymond Hood and Gordon Jeeves as a smaller cousin of New York’s headquarters of the American Radiator Company, of which the National Radiator Company was the European offshoot. The company started in the 1890s, just as central heating using boilers and radiators was catching on, and did well in both North America and Europe. In the interwar period, more and more houses were being fitted with central heating: to many people it seemed like the latest thing, even though it had been around for decades by then, and a landmark building in the latest, swankiest style must have seemed to project just the right image. The most lavish finishes were employed. 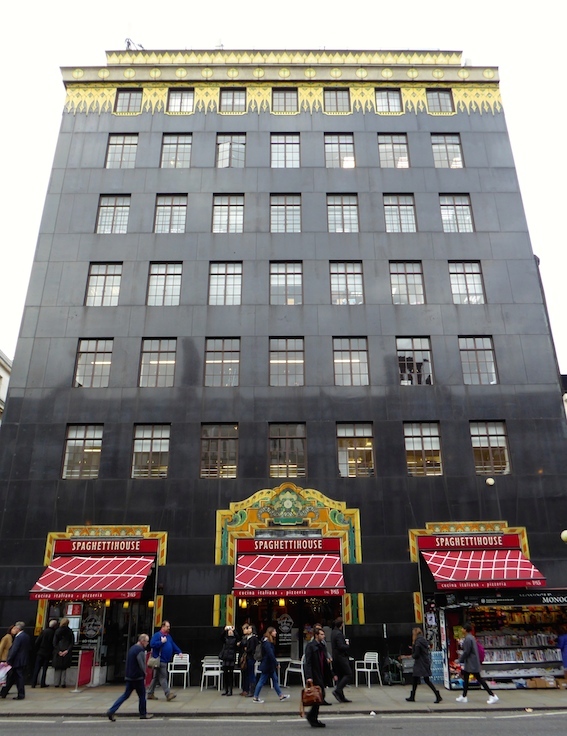 The walls are covered in polished black granite (in the right light it looks very black) and the cornices and lower window surrounds are done out in gold enamel cladding with touches of red and green. These details are in the Egyptian style (art deco could be very modern and very ancient at the same time): Egyptian decoration was very fashionable in the late-1920s, in part because the opening of Tutankhamen’s tomb had got so much publicity. So the radiator-makers would have felt they were getting the latest thing – and in their corporate colours, black and gold, too. Nearly 80 years on, the building is still an eye-catcher, even if most passers-by have eyes only for the seductive windows of Mr Liberty. During World War II being a war artist was not necessarily a safe or easy option. One of the most famous war-time artistic casualties was Eric Ravilious, who was in a an aircraft that was lost off Iceland while searching for another plane that had come down. What’s perhaps less well known is that Thomas Hennell (1903–1945), the artist who replaced Ravilious in Iceland, was himself a wartime casualty. Having worked with the RAF in Burma, Hennell lost his life in Surabaya, Java, in November 1945, after being captured by nationalist fighters; the precise circumstances of his death don’t seem to be known. The book from which my illustration comes is Hennell’s last, The Countryman at Work (1947), assembled after his death from a series of illustrated articles he wrote for the Architectural Review.¶ These short and highly informative essays cover 15 or so traditional crafts, from blacksmithing to thatching, hedging to the production of Windsor chairs. In each case, the craftsman is portrayed in his place of work, and the drawings convey a wonderful sense of the people, the setting, the tools, and the job. I’ve chosen the Scythe-Smith, though it could easily have been one of the others. I like its sense of the working space – a high-ceilinged building full of heat and the noisy beating of the huge tilt-hammer, the head of which is right in the centre of the frame. In his text Hennell describes in detail the processes used in making a scythe blade. The picture shows one man standing at the forge, manipulating a pair of tongs that hold in the fire a bundle of four steel or iron bars. When the bars are hot enough, he will pass them to his colleague seated at the hammer, so that they can be welded together by the hammer’s hefty blows. Each welded bundle of bars will eventually make two scythe blades, another man cuts the piece in two with an enormous cutting device, which I think is what the third man, bent to the task in the middle foreground, is doing. Both hammer and cutter are driven by a waterwheel that turns the shaft which, with its various wheels, takes up most of the right-hand part of the illustration. I wonder whether this post-war publication with its coarse paper does full justice to Hennell’s drawings. Their line is sometimes broken and uneven, and I think the reproduction might overemphasise this. However, there’s still much to admire – the credible way in which the figures are positioned, the details of tools and machines, the sense that there’s a lot going on, but that everything is in its place. And the sense of space and its special adaptations – that vent in the roof at top left, the hanging chain (it supports the hammer-man’s seat, so that he can move about as needed without getting up), the round pillars on either side of the forge (c. 1780, Hennell tells us). We are in a lost world – a world of traditional Midlands metalwork: hard, back-breaking stuff, redolent of Ruskin’s memorable account of Worcestershire nailers in Fors Clavigera,† but bereft of romanticism and full of metallic crashing and clanking. The white heat of old technology. * Most of my information about Hennell comes from H J Massingham’s introductory memoir in The Countryman at Work. 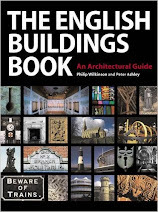 ¶ A book to place on the shelves along side Dorothy Hartley’s Made in England and John Seymour’s The Forgotten Arts, all three good surveys of the same subject area. † John Ruskin, Fors Clavigera, Letter LXXX. When I say a ‘lost world’ I don’t mean that it’s gone completely (though specialists like Henell’s scythe-smith are rare as hen’s teeth, there are many general smiths doing stirling work). Just that most of us have lost our connection with it, to our detriment. Boldly incised Norman piers, carved with patterns such as spirals and chevrons, occur only now and then in parish churches. Usually this kind of treatment appears in high-status churches – the famous nave of Durham Cathedral, the crypt at Canterbury, Norwich Cathedral, and so on. I’ve also noticed a Saxon version in the very special crypt at Repton. But by and larger one finds plainer piers in smaller churches, though perhaps their generous cylindrical surfaces were once enlivened with bold painted patterns. How refreshing then, to come across such columns in a smaller church – but in miniature, in the carved relief around the Norman font at Rendcomb. This lovely font depicts eleven of the apostles plus a blank space for the twelfth, Judas, in Romanesque arches with incised patterns – chevrons, lozenges, spirals, and so on, very like their enormous cousins at Durham. The figures are boldly carved and their garments are carved with bold incised patterns that reflect and complement those on the columns. There is also some rather Classical framing ornament – a version of Greek key and some stylised foliage that seems to have taken its inspiration from anthemion at the top and bottom of the font respectively. The font has had a chequered history. 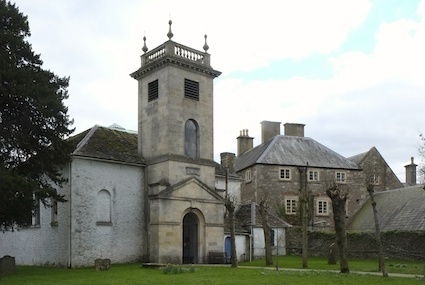 It doesn’t seem to have started life in this church, but was brought here by the Guise family, who owned the great house (now Rendcomb College) nearby for use as a garden ornament. In the middle of the 19th century someone recognised its worth and the font was moved inside the church. It seems to have endured all this quite well, although the key pattern at the top looks as if it has been curtailed at some point. Overall though, this is still a belter of a font, and a joy to find in a small and little regarded church.